In more “crossing state lines to eat at various burger joints” news, not only did I recently chow down at Shake Shacks in the Philly and CT areas, I also ate at 2 different Bobby’s Burger Palaces: The West Philly/University City location (There’s also a location in Cherry Hill, NJ for those of you willing to pay a toll) and at Mohegan Sun Casino in Uncasville, CT.
Palace, you say? Sounds fancy! If you’ve never been, it’s pretty much a fast-casual style restaurant: You put your order in with a cashier, get a number, take a seat, and eventually your food comes out to you. The counter set-ups are pretty cool, with funky lighting and “Lettuce Green” swivel seats. In addition to their regular dining room, the Mohegan Sun location also has a separate bar area with a kind of “sports bar” feel. 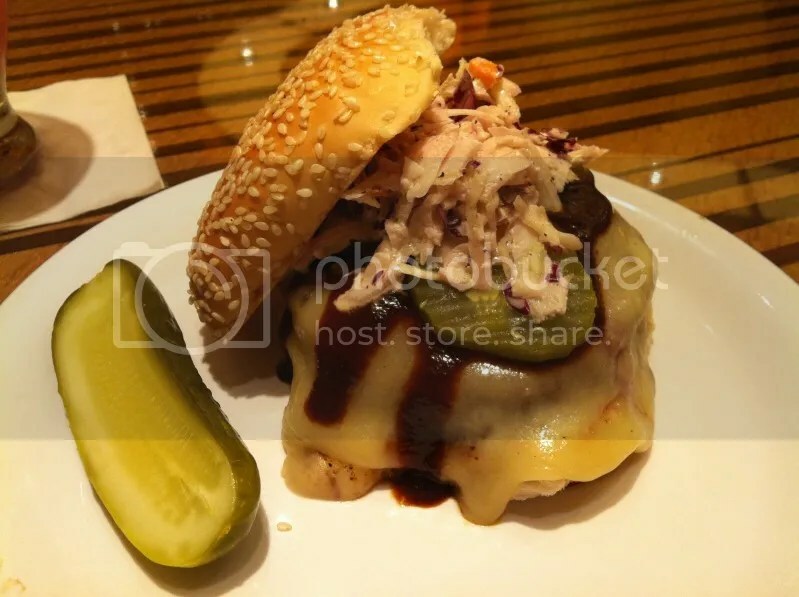 Both locations have the same menu offerings – with the exception being that the Philly location gives you the option to get your Philadelphia burger “Wit Wiz”. And also, pricing: Burgers cost the same, but booze is a little bit more at Mohegan (probably because it’s in a casino), but they also offer an extensive bottled & draft beer list as opposed to just bottles in Philly. In addition to the regular burgers on the menu, BBP also offers a “Burger of the Month”, which, as I’m sure you can already guess, is an off-menu burger that changes on a monthly basis. You can also opt to have your burger “Crunch-ified”, meaning they just pile a bunch of crushed up potato chips on top. That’s not really my thing, but it’s there if you decide it’s your thing! They aren’t playing around either. When they say Medium, they mean Medium! 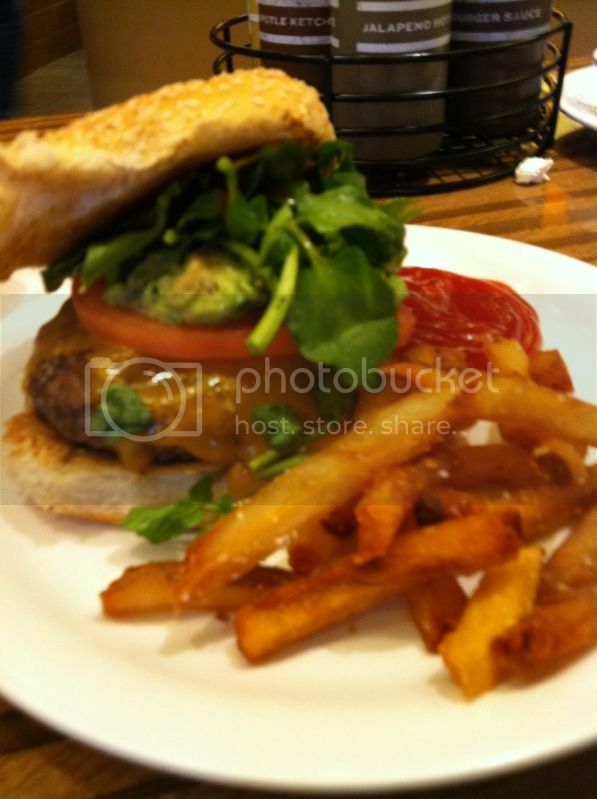 At BBP-Philly, I ordered the L.A. Burger, which is topped with Avocado Relish / Watercress / Cheddar Cheese/Tomato. Put avocado and cheddar cheese on just about anything and I’ll eat it. And even though it sounds weird, the watercress tastes great and makes you feel like you’re being really healthy about this delicious, juicy burger that you’re eating. At BBP-Mohegan, I ordered the Dallas Burger, which is spice crusted and topped with coleslaw, Monterey jack cheese, BBQ sauce and pickles.This is my Dad’s usual go-to at BBP. He loves BBP because he thinks it tastes just like a burger that you would make at home. It’s got a nostalgic, sesame seed topped bun and that slight, off the grill char while still being flavorful and not greasy. I also usually get the Frozen Cactus Pear Margarita. 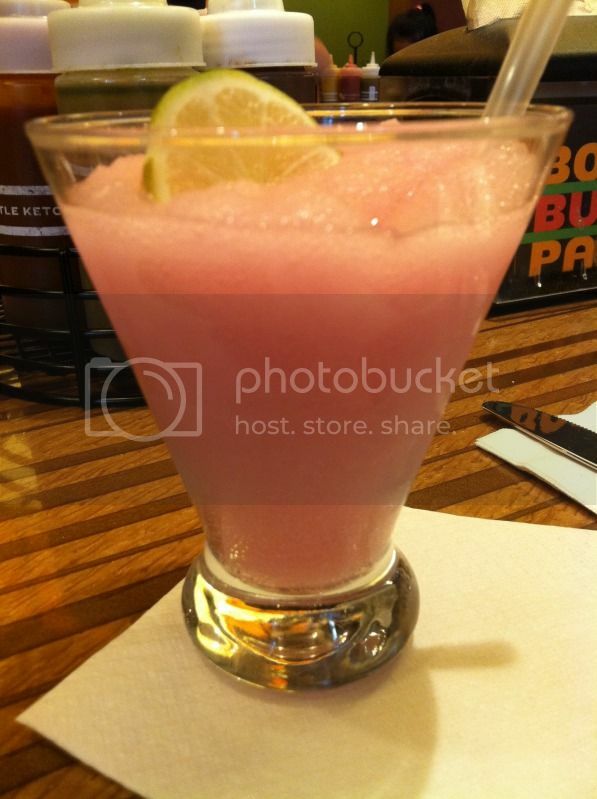 I have no idea what a cactus pear is but it’s pink and there’s booze in it and it’s delicious! They’ve also got fries (regular and sweet potato) and the biggest friggin onion rings ever. I actually took one of the onion rings and put it on top of my Dallas burger and all I could think was “Why does it not already come like this! ?” Mouthgasm. 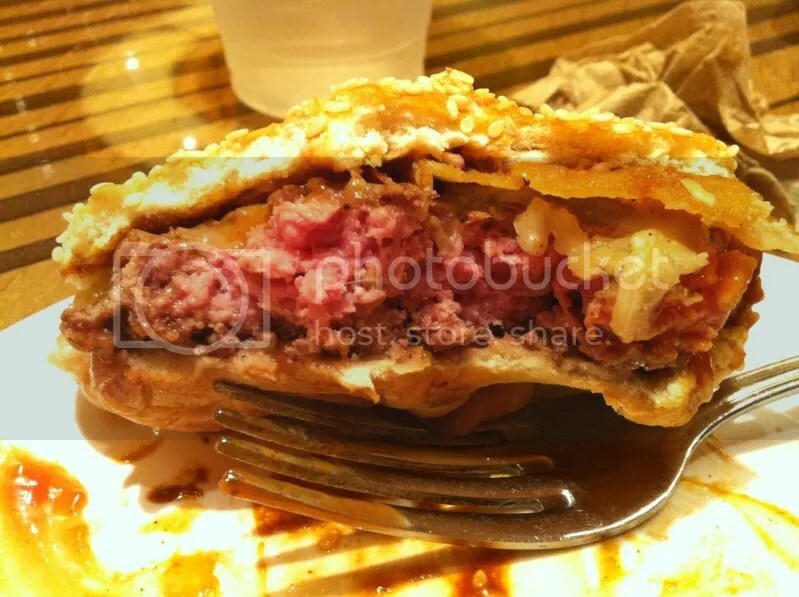 Hopefully this run-down helped ease the fears of any of you who may have been skeptical because it’s a Bobby Flay place, but it’s actually really good, reasonably priced and the burgers are delicious. So get on over to BBP and crunchify yo’self! Posted in bobby's burger palace, burger, cheese, dallas, margarita, mohegan sun, philly, pickles. Bookmark the permalink.